Share this product and receive a $8.80 sharing discount. 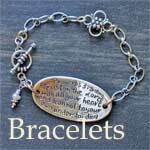 This large, gorgeous piece makes a visible statement of Dignity and Strength to the wearer. 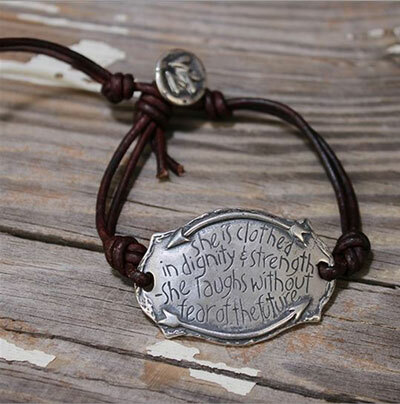 Two long arrows encircle the verse "She is clothed in dignity & strength - She laughs without fear of the future," is etched on the front, and on the back, "Proverbs 31:25". Comes standard on dark brown, 2mm leather, and is 1 and 5/8" long, 1 and 1/8" wide at its widest point. A round button with three delicate hearts acts as a closure on the "back" of the bracelet.